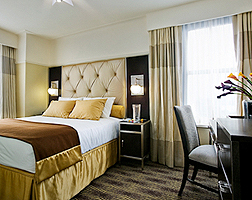 The New Yorker is a great choice of hotel for those travellers who want to be right in the centre of the New York action, but still want to stay in a stylish and exciting hotel. With a wealth of history and wonderful interior décor, The New Yorker is more than just a place to sleep each evening. Rooms at The New Yorker range from the Metro Room, which can sleep two adults, to the New Yorker Suites, which are larger and offer terraces with wonderful views over the city. Regardless of which room you choose, you’ll find that your accommodation is bright and modern, with a flat-screen HD TV with cable, free broadband Wi-Fi, an iron and ironing board, hairdryer, desk and chair and large, comfortable bed. Bathrooms are similarly spacious and modern, making The New Yorker an exciting city-centre hotel.